Obama Administration Officials are Euphoric Over "New Deal" in Arab-Israel Conflict…….. – The Tundra Tabloids……. 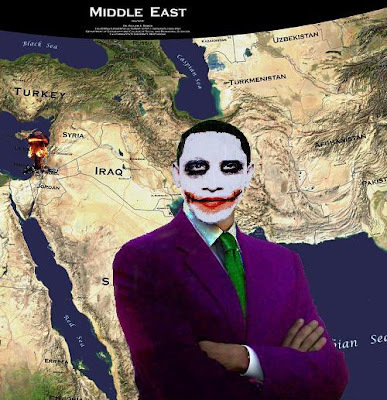 Obama Administration Officials are Euphoric Over "New Deal" in Arab-Israel Conflict…….. The Tundra Tabloids is of the opinion that e veryone needs to take this latest news blurb with a grain of salt. This new intitiative is loaded with stumbing blocks, and by the look of things, Obama is pinning his hopes on pushing the Israelis to back it, in spite of him offering nothing but empty handed promises. Obama wants Israel to believe that he’ll take the Iranian issue seriously, and who knows, there might be something to it, but his record shows nothing that he could be taken seriously in the “use of the heavy stick” department. He’s failing miserably now in both Iraq and Afghanistan, but to fair, that’s somehing he inherited from the Bush years, but he’s not capitalizing on former gains. A more likely scenario is that he’ll use promises, and the fervrent belief in them, plus carrots…lots of carrots to Israel’s enemies, to try and induce the Israelis to sign on with the latest peace initiative. The word ‘folly’ comes to mind. Read the article in full and pick out the parts that reek of naievity and foolishness. I find it difficult to believe that the Russians and the Chinese, in which the latter holds hundreds of billions of US debt, are going to approve of the US placing stricter sanctions against Iran, let aloe bombing it. The Iranians are not that far away from getting their bomb, something of which should frighten the crap out of Europe, as well as the average Iranian. If the latter believes that tehy were mistreated during the recent election riots, just wait and see what happens once Iran joins the nuclear bomb club, then will the gloves really come off. Barack Obama is close to brokering and Israeli-Palestinian deal that will allow him to announce a resumption of the long-stalled Middle East peace talks before the end of next month, according to US, Israeli, Palestinian and European officials. Key to bringing Israel on board is a promise by the US to adopt a much tougher line with Iran over its alleged nuclear weapons programme. The US, along with Britain and France, is planning to push the United Nations security council to expand sanctions to include Iran’s oil and gas industry, a move that could cripple its economy. Details of the breakthrough deal will be hammered out tomorrow in London, where the Israeli prime minister, Binyamin Netanyahu, is due to hold talks with the US special envoy, George Mitchell. Netanyahu met Gordon Brown today in Downing Street, where the two discussed both settlements and the Iranian nuclear programme. Although the negotiations are being held in private, they have reached such an advanced stage that both France and Russia have approached the US offering to host a peace conference. Obama has pencilled in the announcement of his breakthrough for either a meeting of world leaders at the UN general assembly in New York in the week beginning 23 September or the G20 summit in Pittsburgh on 24-25 September. If Iran does not respond to UN demands that it stop enriching uranium by time of the UN and G20 summits, the US, Britain and France are to lead a UN security council push to expand sanctions, expected to target Iran’s dependence on imports of refined petroleum products and its reliance on foreign technology to develop its oil and gas industry. Russia and China are expected to object to such punitive measures, and any western attempt to enforce a partial embargo threatens to breach the broad international consensus on handling Iran. A report on the Iranian programme by the UN’s nuclear watchdog, the International Atomic Energy Agency (IAEA), due to be published by the end of this week, will be crucial in setting the scene for such sanctions, and the outgoing IAEA director general, Mohamed ElBaradei, has come under intense western pressure to make the report sharply critical of Tehran. Next Post Next Post Canada: Muslim Fakes Own Kidnapping, Media Falls for it Hook, Line and Sinker……..